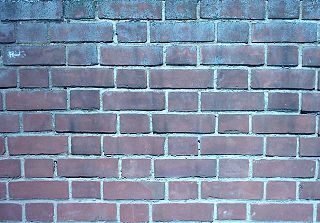 A brick wall built using a brick-laying pattern known as "Flemish bond." Masonry is the building of structures from individual units laid in and bound together by mortar. Common materials used for masonry are brick, stone (such as marble, granite, and limestone), concrete block, glass block, and tile. Knowledge of and skill in masonry are essential for the construction of buildings used for homes, schools, offices, industries, and so forth. The construction process needs to take into account such factors as durability, fire resistance, and appearance of the structure. These factors are affected by the quality of materials used, workmanship involved, and the pattern in which the units are laid. Masonry is commonly used to make the walls of buildings, retaining walls, and monuments. Brick is the most common type of material chosen and may be used for weight-bearing purposes or to form a veneer. Another material is concrete block, which is rapidly gaining in popularity. Concrete blocks—most of which have hollow cores—offer various possibilities in masonry construction, generally providing great compressive strength (for vertical loads). Filling some or all of the cores with concrete, stone, or steel reinforcement (typically "rebar") offers much greater tensile strength (to accommodate twisting or stretching) and lateral strength (for "sideways" loads) to the structures. The use of materials such as brick and stone can increase the "thermal mass" of a building. In other words, the material absorbs and retains heat during sunny periods, keeping living spaces cooler, and it releases heat at night, when living spaces need the heat. Brick typically will not require painting and so can provide a structure with reduced life-cycle costs. Non-decorative concrete block is generally painted or stuccoed, if exposed. When well crafted, the appearance can impart an impression of solidity and permanence. The material is very heat resistant and provides good fire protection. Extreme weather may cause degradation of the surface, due to frost damage. This type of damage is common with certain types of brick, but relatively rare with concrete block. If non-concrete (clay-based) brick is to be used, care should be taken to select bricks suitable for the climate. Masonry must be built on a firm foundation—usually reinforced concrete—to avoid potential settling and cracking. When built on expansive soils, such as adobe clay, this foundation may need to be quite elaborate and the services of a qualified structural engineer may be required. The high weight increases structural requirements, especially in earthquake-prone areas. Masonry boasts an impressive compressive strength but is much lower in tensile strength unless reinforced. The tensile strength of masonry walls can be increased by thickening the wall, or by building masonry "piers"—vertical columns or ribs—at intervals. Where practical, steel reinforcement can also be introduced vertically and horizontally to increase tensile strength, though this is most commonly done with poured walls. One technique used to boost the tensile strength of poured concrete is called prestressing. It involves "stretching" steel rods and essentially pouring concrete around them to form heavy-construction elements such as bridge girders and hollow-core plank. After the concrete is cured, the steel rods are cut off at the ends, and the rods "contract" just enough to pull the concrete inward, increasing its density slightly and greatly increasing its strength against "sideways" loads. In the case of brick veneer construction, a layer of bricks is placed on or attached to a framework of wood or rough masonry wall of other material. The brick layer, receiving strength from the framework, provides weatherproofing and a finished appearance. The brick veneer wall is connected to the structural walls by "brick ties"—metal strips that attach the brick to the structural wall and mortar joints. There is typically an air gap between the brick veneer wall and the structural wall. As clay brick is not completely waterproof, the structural wall has a water-resistant surface (usually tar paper), and "weep holes" are left at the base of the brick veneer wall to ventilate the air gap. Veneer walls are often structurally superior to solid, unreinforced brick walls because the core can be constructed of block reinforced by steel or poured concrete. Block may also offer opportunities to run utilities within the wall, if some block cores are left unfilled for this purpose. In addition, because concrete and cinder block are waterproof, the aforementioned air gap, weep holes, and tarpaper needed with a wood-framed structural wall are typically unnecessary with a block structural wall. Most insulated buildings that utilize concrete block and brick veneers feature interior insulation in the form of fiberglass. In most climates, this insulation is much more effective on the exterior of the walls, allowing the building interior to take advantage of the thermal mass of the masonry. This technique, however, requires some sort of weather-resistant exterior surface over the insulation and is usually more expensive. The strength of a masonry wall does not entirely depend on the bond between the building material and the mortar. The friction between interlocking blocks of masonry is often strong enough to provide a great deal of strength on its own. The blocks sometimes have grooves or other surface features to enhance this interlocking, and some "dry set" masonry structures forego mortar altogether. Solid masonry, without steel reinforcement, tends to have very limited applications in modern wall construction. Although such walls can be economical and suitable for some applications, they are susceptible to earthquakes and collapse. Consequently, solid unreinforced masonry walls tend to be low and thick. Solid brick masonry is made of two or more layers of bricks in which "stretcher" bricks, which run horizontally, are bound to "header" bricks that are placed transverse to the wall. Each row of bricks is known as a course. The pattern of headers and stretchers employed gives rise to different "bonds," such as the common bond (with every sixth course composed of headers), the English bond, and the Flemish bond (with alternating stretcher and header bricks present on every course). There are no significant utilitarian differences between most bonds, but the appearance of the finished wall is affected. Vertically staggered bonds tend to be somewhat stronger and less prone to major cracking than non-staggered bonds. The selection of the brick used, especially for color, will affect the appearance of the final surface. In buildings built during the 1970s, a high degree of uniformity of brick and accuracy in masonry was typical. In later periods, this style was thought to be too sterile, so attempts were made to emulate older, rougher work. Some brick surfaces are made to look particularly rustic by including "burnt" bricks, which have a darker color or irregular shape. Others may use antique salvage bricks, or new bricks may be artificially aged by applying various surface treatments. The attempts at rusticity of the late twentieth century have been carried forward by masons specializing in a free, artistic style in which the courses are intentionally not straight but weave to form more organic impressions. A "crinkle-crankle wall" is a brick wall that follows a serpentine path, rather than a straight line. This type of wall is more resistant to toppling than a straight wall, so much so that it may be made of a single thickness of unreinforced brick. Consequently, despite its longer length, it may be more economical than a straight wall. Blocks of cinder concrete ("cinder blocks" or "breezeblocks"), ordinary concrete ("concrete blocks"), or hollow tile are generically known as Concrete Masonry Units (CMU)s. They are usually much larger than ordinary bricks and much faster to lay for a wall of given size. Furthermore, cinder and tile blocks have much lower water absorption rates than brick. They are often used as the structural core for veneered brick masonry, or are used alone for the walls of garages, factories, and other industrial-type buildings where the appearance is not a significant factor. Such blocks often receive a stucco surface for decoration. Surface-bonding cement is sometimes used in this application and can impart extra strength to a block wall. The primary advantage of concrete blocks in comparison to smaller, clay-based bricks is that a CMU structure can be reinforced by either fully grouting the voids or inserting vertical lengths of rebar and using grout to hold them in place. In this manner, a CMU wall can be built much stronger than typical masonry walls. Some concrete blocks are colored, and some employ a "split face"—a technique that results in two blocks being manufactured as one unit and later split into two. This gives the blocks a rough face replicating the appearance of natural, quarried stone, such as brownstone. (Examples of split-face block, as well as other types of CMUs and brick, can be seen here.) For applications such as roadway sound control walls, the patterns may be complex and even artistic. Decorative CMUs have gained in popularity, with units featuring a glazed, burnished, or glossy finish. Decorative CMUs most often appear in financial institutions, schools, and other municipal or professional settings that need a product that is aesthetically pleasing but also durable. Stone blocks used in masonry can be "dressed" or "rough." Stone masonry utilizing dressed stones is known as ashlar masonry, and that using irregularly shaped stones is known as rubble masonry. Both rubble and ashlar masonry can be laid in courses (rows of even height) through the careful selection or cutting of stones, but a great deal of stone masonry is uncoursed. Sometimes "river rock" (ovate-shaped smooth stones) is used as a veneer. This type of material is not favored for solid masonry as it requires a great amount of mortar and can lack intrinsic structural strength. Manufactured stone veneers are growing in popularity among builders and homeowners. Some companies pull natural stones from quarries around the world, create molds from them, and recreate those stones with concrete. To the casual observer, there is no visual difference between veneers of natural and manufactured stone. Gabions are rectangular wire cages, usually of zinc-protected steel, filled with medium-sized, fractured stone. They are stacked with setbacks to form a retaining wall, and together they act as a single unit. They offer the advantages of being well-drained and flexible, so they are resistant to flooding, water flow from above, frost damage, and soil flow. As their expected useful life is only as long as that of the wire used, the wire needs to be made of corrosion-resistant material when used in severe climates or saltwater environments. In some cases, low-grade concrete is placed in woven plastic sacks similar to that used for sandbags and placed where needed. The sacks are watered, so that the emplacement becomes a series of artificial stones that conform to one another and to adjacent structures and soil. This conformation makes them resistant to displacement. Eventually, the sack becomes nonfunctional and disintegrates. 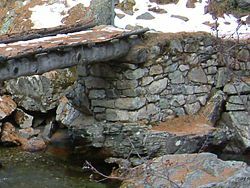 This type of masonry is frequently used to protect the entrances and exits of water conduits, in places where a road passes over a stream or dry wash. It is also used to protect stream banks from erosion, especially when a road passes close by. Stonemasonry is one of the oldest professions in the history of construction. It is regarded as a traditional skill and is in heavy demand. Prospective stonemasons learn the profession through apprenticeships or traineeships that last three to four years. Some specialized colleges offer stonemasonry courses that combine training in theory with practical learning. Masonry walls are subject to stringent installation requirements known as bounding, and there are "new" systems as well as "old" ones. Old systems are those that have been standardized over many decades, and their performance under fire conditions is known and listed in "old" catalogs. Masonry walls can also use "new" methods in terms of their PFP (passive fire protection) classification, based on recent certification listings. The new systems may consist of, for instance, foamed concrete as well as concrete that contains lightweight aggregates, such as shale. For PFP, masonry walls offer major advantages, such as the heat-absorbing effect of the water (that is chemically bound and unbound) in the concrete and mortar used. Also, the sheer mass of masonry walls acts as a "heat sink" that absorbs heat during fires. This makes for extremely reliable, well-documented PFP, much less affected by onsite errors than drywall systems of equal fire-resistance ratings. When a wall contains "penetrants" such as pipes and cables, the fire resistance of the wall needs to be restored by the use of "firestops." During a fire, a firestop mortar (which is quite different from the structural mortar used to lay bricks) absorbs heat, carries it away from penetrants, and transfers it into the surrounding structure. This page was last modified on 31 August 2018, at 14:44.